The En Taupe palette has a pretty packaging, it's brown with a geometric print. That print has holographic rainbow effect, pretty! The last palettes look so different than Zoeva's first palettes. I wasn't too big of a fan of those packagings, but I love the latest palette styles. As the name says, this palette is all about taupe colors. It's inspired by precious fabrics, like a tailor-made silk robe that ows with every movement. "Life is a runway - walk it confidently with these modern couture colors." I didn't even realize how pretty taupe colors actually are until I got this. I expected a palette filled with colors like 'Gallery', but there is enough variety of colors. Brownish-grey, beige and gunmetal hues with violet undertones. Zoeva says that it's a mix of warm and cool tones but I'm not sure, none of these really look warm to me. The eyeshadows are enriched with vitamin e and are free of parabens, mineral oils, perfume and phthalates. As you can see on the swatches, the colors are very pigmented. They're also easy to apply and blend and (almost) have no fallout. 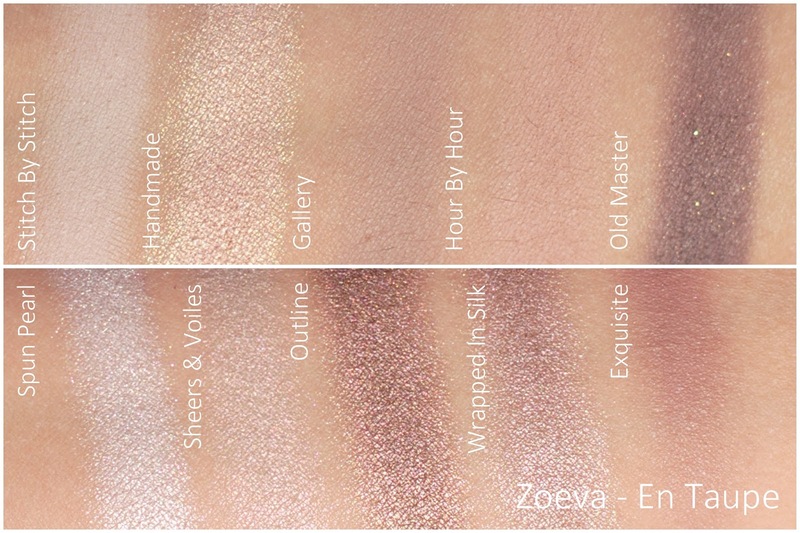 I also like that Zoeva mixes a lot of finishes in one palette. In this one there are some mattes, satins, some duo chrome, pearl and a matte with glitter. But next to qualitatively good, they are also stunning. I usually switch between my Rose Golden palette and the Cocoa Blend, but this one only contains shades that I wear on a daily base, so I already have used it a lot. My favorite is Handmade, it has a metallic pink-greenish shine. I also really like Spun Pearl, Outline and Wrapped In Silk - I just really like the metallic-like feeling and look. Again a very pretty palette by Zoeva, and I can't stress enough that these are definitely worth the money. I have tried high-end palettes, 5 times this price, that can't compete with the Zoeva quality. You got me again Zoeva, looking forward to the next palette! Do you like the colors on the swatches? Ik heb het palet al her en der gezien, telkens denk ik: mooi! Taupe (en alles daarrond) is gewoon zo'n fijne kleur om mee te werken! So many beautiful colors! I think Wrapped in Silk is my favorite, but they all look great! Dat doosje alleen al! Ik moet dringend eens oogschaduw leren gebruiken! Gorgeous!!! Looks like a really pretty palatte. Beautiful photos as always rani!! Wauw! Prachtige kleurtjes heeft dit palette! Ik vind het zo'n mooie palette!